Home Lifestyle What constitutes a large egg? What constitutes a large egg? The recipe calls for two large eggs. You look in your carton and see different sizes. Hmm. What exactly constitutes a large egg? According to Wikipedia, a jumbo egg weighs in at approximately 70g, an extra-large at 63g, large at 56g and a medium egg at 49g. When your recipe calls for large, does it really matter if you use one size up or one size down? Actually, it does. Recipes are created with a balance. If you use more flour than called for with a cake, your final product is going to come out heavy. Too much sugar can cause it to be overly sweet, and possibly grainy. Eggs are considered a liquid in recipes, and too many, or not the right size will effect the amount of liquid in your mix. Why do recipes call for large eggs? Again, it is due to the liquid ratio. A large egg is approximately 3-1/4 Tablespoons of liquid. If your recipe calls for whipping egg whites, as for an Angel Food cake, too much will cause problems with your cake. Liquid is heavy, even if it is whipped to cloud-like proportions. If your recipe calls for one large egg, and all you have on hand is extra-large, don’t sweat it. The difference isn’t enough to ruin your recipe. But don’t think you can use eight extra large eggs in a pound cake recipe that calls for eight large eggs. With each extra-large egg, you are adding an extra 1/4 Tablespoon of liquid, which will be like adding almost two extra eggs. Trust me – your pound cake will be a flop! On a different note, if you are baking a quiche, scrambled eggs or an omelet, go ahead and break open those extra-large eggs. These are primarily egg dishes, after all. However, if you add cream, milk or even cheese to the mix, you may want to back off just a bit on the liquid to keep your recipe from being on the runny side. As far as the color of eggs go, a brown egg is as good as a white one. If, however, you are using duck eggs, your dish will come out tasting a bit richer, and possibly a bit stronger. 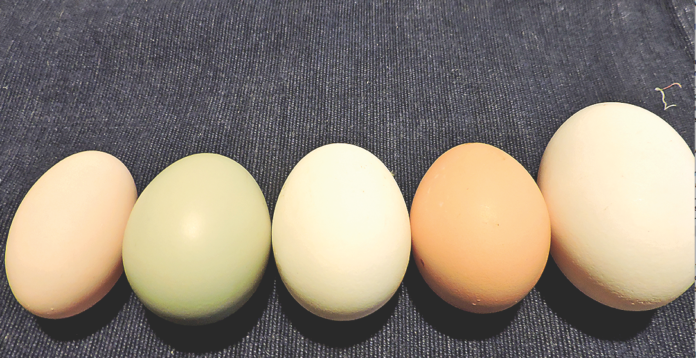 If you choose guinea eggs or bantam eggs (classified as PeeWee), get ready to start weighing them to come up with the proper weight for a recipe!